Uncle John, my dad’s only (and younger) brother, was in the service stationed in Japan in the early 1950s. 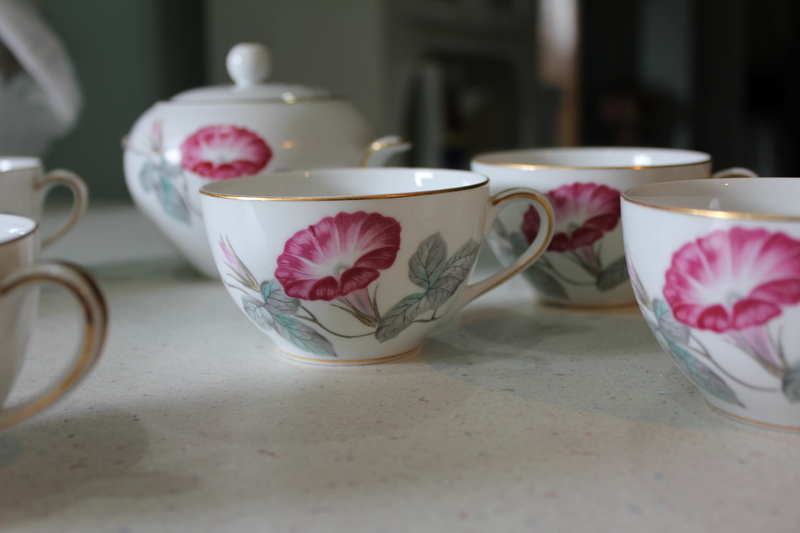 When he came home, he brought all his sisters (including his lone sister-in-law) a lovely tea set. 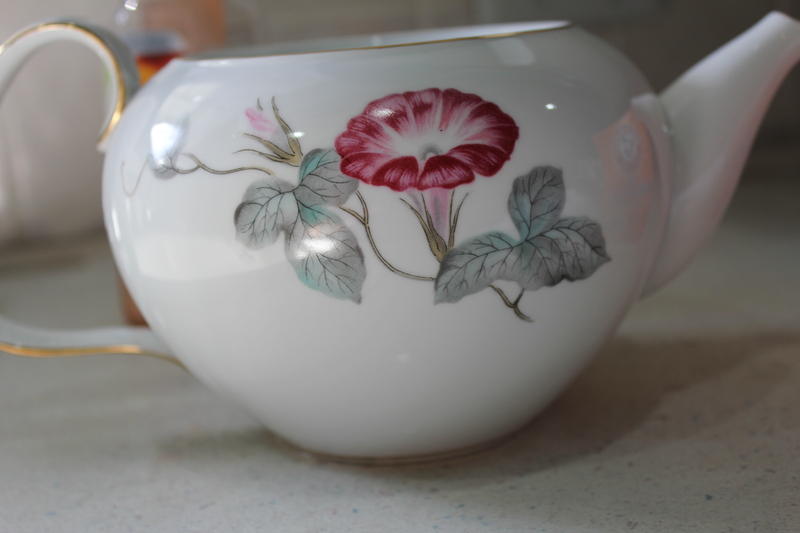 The pattern is Noritake Morning Glory and from what little information I’ve been able to find, it was only manufactured from 1950-1953. I can remember my mom using her tea set for extra special occasions. 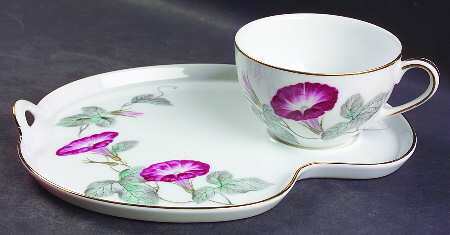 She would carefully take the cups and the little snack plates down from the high shelf of a cupboard and serve special little sweets to the ladies gathered in our home. Long admiring the set, I was thrilled beyond words when my Dad gave it to me the last time we were at their house. Trying to downsize since their move from the farm into town, I was more than happy to give the tea set a new home. 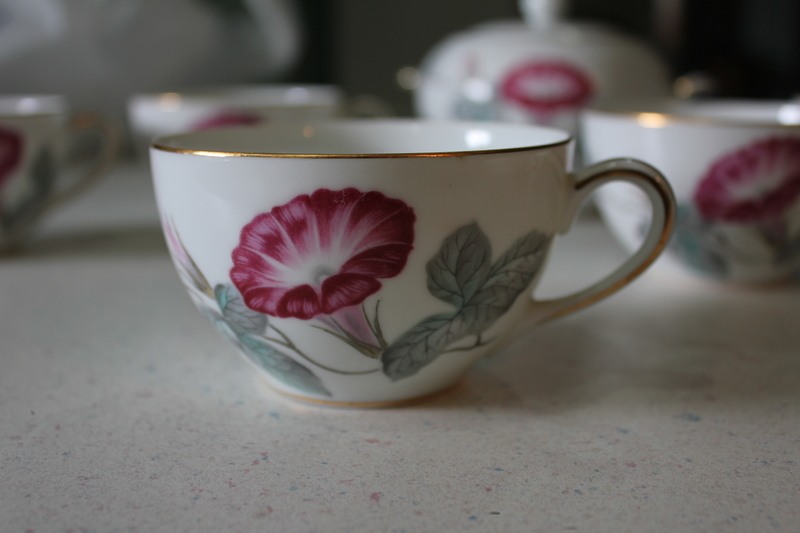 And I need to plan a little party so I can use these beautiful china pieces. Thanks, Uncle John, for being so sweet and bringing them back to your sisters in the first place! Wow, when you have that tea party, I hope to receive an invite! Unfortunately, he (your Uncle John my Dad) did not think ahead and bring home a tea set for his yet unmeant wife so his daughters did not grow up with a lovely tea set from Japan. He did bring home a couple of beautiful handmade suits for himself and some really cool pictures and Japanese money. It is what convinced me I wanted to travel around the world when I grew up. Japan is one of the countries on the list this year! Hi Tamra! That is so cool about your plans to travel the world. You must send me a postcard from Japan! =) When I get around to that tea party, I’ll definitely let you know. I was thinking the cousins with the sets should get them all together and have a big party sometime!